This is the value of the teacher, who looks at a face and says there's something behind that and I want to reach that person, I want to influence that person, I want to encourage that person, I want to enrich, I want to call out that person who is behind that face, behind that color, behind that language, behind that tradition, behind that culture. I believe you can do it. I know what was done for me. The transformative power of an effective teacher is something almost all of us have experienced and understand on a personal level. If we were particularly fortunate, we had numerous exceptional teachers who made school an exciting and interesting place. Those teachers possessed a passion for the subjects that they taught and genuine care for the students with whom they worked. They inspired us to play with ideas, think deeply about the subject matter, take on more challenging work, and even pursue careers in a particular field of study. Some exceptional teachers achieve celebrity status, such as Jaime Escalante, the math teacher who inspired the film Stand and Deliver, but thousands of unsung heroes go unrecognized in their remarkable work with students on a daily basis. Have formal teacher preparation training. Hold certification of some kind (standard, alternative, or provisional) and are certified within their fields. Have taught for at least three years. Are caring, fair, and respectful. Hold high expectations for themselves and their students. Dedicate extra time to instructional preparation and reflection. Maximize instructional time via effective classroom management and organization. Enhance instruction by varying instructional strategies, activities, and assignments. Present content to students in a meaningful way that fosters understanding. Monitor students' learning by utilizing pre- and postassessments, providing timely and informative feedback, and reteaching material to students who did not achieve mastery. Demonstrate effectiveness with the full range of student abilities in their classrooms, regardless of the academic diversity of the students. For a complete listing of these qualities with references, please refer to Appendix A. Not only does a reasonable consensus exist on what effective teachers do to enhance student learning, but also meta-analyses by researchers such as Marzano, Pickering, and Pollock (2001) have begun to quantify the average effects of specific instructional strategies. When properly implemented, instructional strategies such as identifying similarities and differences, summarizing and note taking, and reinforcing effort and providing recognition can result in percentile gains of 29–45 points in student achievement.2 Such an increase would mean that the score of an average student at the 50th percentile might rise to the 79th or even the 95th percentile with the effective use of selected instructional strategies. While teaching undeniably will remain an art, there is also a science to it that we are only beginning to aggressively apply to practice. As observed by Mike Schmoker, author of Results: The Key to Continuous School Improvement, “when we begin to more systematically close the gap between what we know and what we do, we will be on the cusp of one of the most exciting epochs in the history of education.”3 With state standards and federal legislation, such as No Child Left Behind, more explicitly defining accountability, the time has arrived for a systematic application of our research-based knowledge. In a comparable study by researchers in Dallas, Texas, similar results were found in both math and reading during the early grades.9 When 1st grade students were fortunate enough to be placed with three high-performing teachers in a row, their average performance on the math section of the Iowa Tests of Basic Skills increased from the 63rd percentile to the 87th, in contrast to their peers with similar scores whose performance decreased from the 58th percentile to the 40th, a percentile difference of 42 points. A similar analysis in reading found a percentile difference of 44 percentile points. The studies in Tennessee and Texas produced strikingly similar findings: Highly effective teachers are able to produce much greater gains in student achievement than their less effective counterparts. In straightforward terms, these residual effects studies make it clear that not only does teacher quality matter when it comes to how much students learn, but also that, for better or worse, a teacher's effectiveness stays with students for years to come. Given the growing body of knowledge about the impact of effective teachers on children, it seems that educational policy is beginning to acknowledge the importance of classroom teachers in addition to curriculum standards and assessments. A case in point is the federal No Child Left Behind Act of 2001, which has introduced both the concepts of “adequate yearly progress,” based on annual testing, and “highly qualified teacher,” based on teacher credentials, as strategies to improve U.S. education. According to the legislation, “highly qualified” teachers are defined as those who hold at least a bachelor's degree, are fully licensed or certified by the state in the subjects they teach, and can demonstrate competence in the subjects they teach. While licensure or certification is a significant indicator of teacher quality, these factors alone are insufficient for teacher effectiveness. As discussed earlier, teacher effectiveness is characterized by a far more complex set of qualities than one's professional preparation. It includes dispositions and an array of planning, organizational, instructional, and assessment skills. Effective teachers are able to envision instructional goals for their students, then draw upon their knowledge and training to help students achieve success. A “highly qualified” teacher is certainly a good starting point, but most of us would want our child to have a highly effective teacher whose teaching effort yields high rates of student learning. Despite these substantial drawbacks to the traditional evaluation process, the truly fundamental flaw in such an approach is the assumption that the presence of good practice during the observation equates to the academic success of students. If student learning is our ultimate goal, then it should be measured directly and not extrapolated from limited observations of classroom instruction. A more balanced approach to teacher evaluation would involve an assessment of the act of teaching as well as the results of teaching. We don't suggest throwing out the use of classroom observation to foster teacher improvement; rather we advocate that teacher effectiveness be judged and demonstrated by both classroom instruction and the learning gains of students. Most educators would agree that they are responsible for student learning, but the profession as a whole has avoided evaluations based on measures of student learning, sometimes with good reason, given the unfair approaches that have been proposed. The solution, however, is not to continue with traditional strategies simply because they are benign and comfortable, but rather to develop fair and reasonable means of assessing teacher success with students. A number of school systems and educational programs, to be discussed later in this book, have explored innovative ways of capturing valid and reliable data on student learning to inform the teacher evaluation process. Developing fair approaches for the assessment of teacher effectiveness requires an unflinching look at both the legitimate concerns that have driven the avoidance of a results orientation in the past, and the promising possibilities that make it more attractive in today's climate of greater accountability for student learning outcomes. Collective nature of accountability: Responsibility by all stakeholders. Accountability should be thought of as a collective responsibility for supporting learning by parents, principals, superintendents, school board members, and teachers, to say nothing of the students themselves. Holding teachers accountable for student achievement without recognition of the roles played by these other partners in the educational process is patently unfair and can amount to scapegoating. Likewise, requiring students to attend summer school, or retaining them due to limited progress, avoids the collective nature of accountability if school systems have not provided the quality of instruction necessary for students to meet grade level expectations. Conditional nature of accountability: Resources and student needs. Just as many actors affect the educational process, many variables affect the learning process within a classroom and are beyond the control of the individual teacher. These external variables include the level of support provided by the community and state, the availability of books for every child, the number of computers, sufficient instructional supplies, the support of curriculum specialists, and so forth. Within the classroom, the number and type of students can have dramatic effects on the level of academic achievement experienced by the class. Class size does make a difference, especially when a teacher is expected to work with a large number of at-risk students, whether they are disabled, limited in their English, or poor. Single-point-in-time nature of these indicators. As has become evident, the interplay of factors affecting student learning is multifaceted and quite challenging. It is also difficult to reach consensus on how best to measure student learning. Given these complexities, many educators have avoided being too explicit or public about tracking student learning for the purpose of improving instruction or evaluating performance. However, the current context of high-stakes accountability for students and schools found in most states, and which is being developed as a result of No Child Left Behind, provides an impetus and urgency for examining ways to assess teacher quality that are fair and realistic. Today, superintendents, principals, teachers, and students are being held accountable for higher levels of student achievement. Teachers are being pressured to produce results, yet often lack the necessary information and support to make data-driven instructional decisions. The use of approaches such as those suggested in this book can offer feedback on how to improve instruction in a balanced and meaningful manner. Two primary purposes of teacher evaluation, as noted earlier, are professional growth and accountability. The use of data on student learning in the teacher evaluation process offers a potential tool for both improvement and for refocusing teacher evaluation on the accomplishments of teachers versus stylistic issues or their political standing. Too often, personal opinions or biases contaminate the evaluation process and undermine the credibility and trust necessary for meaningful dialogue about instruction. Reliable and valid information on student learning helps to align the evaluation process with the fundamental concerns of schooling. There are numerous advantages to this approach. More objective measure of teacher effectiveness. The importance of objective data in the evaluation process becomes more striking in a story from one principal in Dallas. As she entered the new school to which she was assigned, the outgoing principal informed her of two problematic teachers for whom she would need to begin laying the groundwork to dismiss. One teacher tended to be scattered in her approach to tasks and had a somewhat disorganized room. Her students were often talking and moving around the room at will as they worked. The other teacher was brusque with her students, rigid with her class rules, and worked the students hard. They were polar opposites in terms of style, but at the end of the year, when the new principal received the test data on the teachers in her building, she found that both of these teachers were top performers in terms of gains in student achievement. She decided that she could tolerate individual personality differences if children were being well served by these teachers. This story offers a compelling message: an evaluation approach that examines both the act of teaching and the results of teaching provides a more balanced and realistic appraisal of teacher effectiveness. Meaningful feedback for instructional improvement. Objective feedback in the form of assessment data also offers an invaluable tool for supervision. As Barbara Howard and Wendy McColskey note, “evaluation that leads to professional growth requires teachers to look honestly at their weaknesses and strengths.”22 Self-assessment can be limited because of a lack of objectivity. Feedback from colleagues or supervisors based on a few classroom visits is equally limited because of the narrow sampling of behavior it provides. Assessment data of student learning over a marking period or even half a year can provide substantive feedback on students' cumulative mastery of material. It provides a broader and richer sampling of the teacher's impact on students and permits the identification of specific patterns in the learning of content and skills that were taught. The evidence from schools that have been successful in increasing the achievement level of students, particularly those serving high-poverty and high-minority populations, has been that better use of data is a key ingredient in their success.23 Data analysis has been used as a means of monitoring success and ensuring accountability for the identified goals of schools and school systems. In a recent study of 32 schools in the San Francisco Bay area, the frequency with which teachers collected, interpreted, and analyzed data for instructional improvement was found to differ among schools that were closing the achievement gap versus those that were not. “Two-thirds of the teachers surveyed in the gap-closing schools said they used test and other data at least several times a month to understand their students' skills gaps, and sometimes several times a week.”24 Instructional responsiveness to student assessments is a powerful tool for increased student achievement. Assessment is an integral facet of instruction. More than 30 years ago, Lortie noted that “the monitoring of effective instruction is the heart of effective instruction.”27 Truly effective teachers monitor student learning on an ongoing basis and use the information to improve their teaching. How do we encourage all teachers to embrace this practice to benefit their teaching and the learning of their students? The purpose of Linking Teacher Evaluation and Student Learning is to present methodologies that have attempted to balance the competing demands of fairness, diagnostic value for professional growth, and accountability for student learning. The details of implementation are daunting; each methodology reflects years of careful consideration of the myriad issues that influence student learning and its assessment. 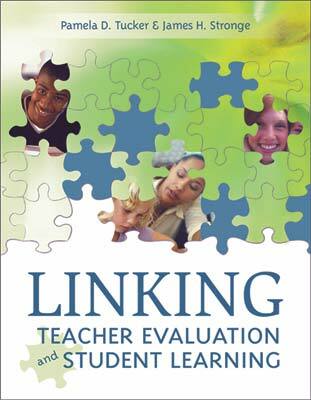 All the models presented in this book have both advantages and disadvantages, but they have a proven track record for connecting teacher evaluation to student learning. Across the United States, school accountability is a theme now commonly heard in the regular discourse among state government officials and local community members. Parents, policymakers, and educators alike have examined their public schools and are calling for, even demanding, improvement. School reform efforts are taking a variety of forms, with two of the most prominent being a focus on higher teacher standards and improved student performance. Assessing Teacher Quality with Student Work: The Oregon Teacher Work Sample Methodology. Assessing Teacher Quality in a Standards-Based Environment: The Thompson, Colorado, School District. Assessing Teacher Quality Through Goal Setting: The Alexandria, Virginia, School District. Assessing Teacher Quality Based on Student Gains: Value-Added Assessment in Tennessee. The concluding chapter will summarize key issues and offer recommendations for educators and policy makers who are interested in making the connection explicit between teacher evaluation and student achievement. 1 See Darling-Hammond, L. (2000). Teacher quality and student achievement: A review of state policy evidence. Education Policy Analysis Archives, 8(1). Retrieved January 22, 2004 from http://olam.ed.asu.edu/epaa/v8n1/ and Stronge, J. H. (2002). Qualities of effective teachers. Alexandria, VA: Association for Supervision and Curriculum Development. 2 Marzano, R. J., Pickering, D. J., & Pollock, J. E. (2001). Classroom instruction that works: Research-based strategies for increasing student achievement. Alexandria, VA: Association for Supervision and Curriculum Development. 3 Schmoker, M. (1999). Results: The key to continuous school improvement. Alexandria, VA: Association for Supervision and Curriculum Development, p. 70. 4 The Tennessee Value-Added Research and Assessment Center work will be high-lighted in more detail in Chapter 6. 5 Sanders, W. L., & Rivers, J. C. (1996). Cumulative and residual effects of teachers on future student academic achievement (Research Progress Report). Knoxville, TN: University of Tennessee Value-Added Research and Assessment Center. 6 Wright, S. P., Horn, S. P., & Sanders, W. L. (1997). Teacher and classroom context effects on student achievement: Implications for teacher evaluation. Journal of Personnel Evaluation in Education, 11, 57–67, p. 63. 7 Sanders & Rivers, 1996, p. 63. 8 Wright, Horn, & Sanders, 1997, p. 57. 9 Jordan, H., Mendro, R., & Weerasinghe, D. (1997, July). Teacher effects on longitudinal student achievement. Paper presented at the sixth National Evaluation Institute sponsored by CREATE, Indianapolis, IN. 10 Mendro, R. L. (1998). Student achievement and school and teacher accountability. Journal of Personnel Evaluation in Education, 12, 257–267, p. 262. The Dallas Public Schools program will be highlighted in more detail in Chapter 6. 11 Mendro, 1998, p. 261. 12 Mendro, 1998, p. 261. 13 Schmoker, 1999, p. 2. 14 Duke, D. L. (1990). Developing teacher evaluation systems that promote professional growth. Journal of Personnel Evaluation in Education, 4, 131–144; McLaughlin, M. W., & Pfeiffer, R. S. (1988). Teacher evaluation: Improvement, accountability, and effective learning. New York: Teachers College Press; Stronge, J. H. (1997). Improving schools through teacher evaluation. In J. H. Stronge (Ed. ), Evaluating teaching: A guide to current thinking and best practice (pp. 1–23). Thousand Oaks, CA: Corwin Press. 15 Iwanicki, E. F. (1990). Teacher evaluation for school improvement. In J. Millman and L. Darling-Hammond (Eds. ), The new handbook of teacher evaluation: Assessing elementary and secondary school teachers (pp. 158–171). Newbury Park, CA: Sage. 16 McGahie, W. C. (1991). Professional competence evaluation. Educational Researcher, 20, 3–9. 17 Educational Research Service. (1988). Teacher evaluation: Practices and procedures. Arlington, VA: Author. 18 Medley, D. M., Coker, H., & Soar, R. S. (1984). Measurement-based evaluation of teacher performance. New York: Longman. 19 Stronge, J. H., & Tucker, P. D. (2003). Handbook on teacher evaluation: Assessing and improving performance. Larchmont, NY: Eye on Education. 20 Schalock, H. D. (1998). Student progress in learning: Teacher responsibility, accountability and reality. Journal of Personnel Evaluation in Education, 12(3), 237–246. 21 Schalock, 1998, p. 237. 22 Howard, B. B., & McColskey, W. H. (2001). Evaluating experienced teachers. Educational Leadership, 58(5), 48–51, p. 49. 23 Cawelti, G. (1999). Portraits of six benchmark schools: Diverse approaches to improving student achievement. Arlington, VA: Educational Research Service; Schmoker, M. (2001). The results handbook. Alexandria, VA: Association for Supervision and Curriculum Development; Skrla, L., Scheurich, J. J., & Johnson, J. F. (2000). Equity-driven achievement-focused school districts. Austin, TX: Charles A. Dana Center. 24 Viadero, D. (2004, January 21). Achievement-gap study emphasizes better use of data. Education Week, p. 9. 25 Schmoker, 1999, p. 39. 26 Schmoker, 1999, p. 44. 27 Lortie, D. C. (1975). School-teacher: A sociological study. Chicago: University of Chicago Press, p.141. 28 National Commission on Teaching and America's Future. (1996). What matters most: Teaching for America's future. New York: Author. 29 National Commission on Teaching and America's Future, 1996, p. 18. 30 Although there are good examples of school-based performance assessment systems, we chose to exclude those from this study and, rather, to concentrate on approaches that focus on individual teacher performance and student learning.